Time travelers it’s a musical journey inspired by the idea that music is a way to transcend the ordinary concept of time. The instruments used for the performance will be a quite unique feature in Thailand: a Baroque Lute, a Baroque Guitar and a Renaissance Guitar, all replicas of original ancient instruments from the European Tradition. 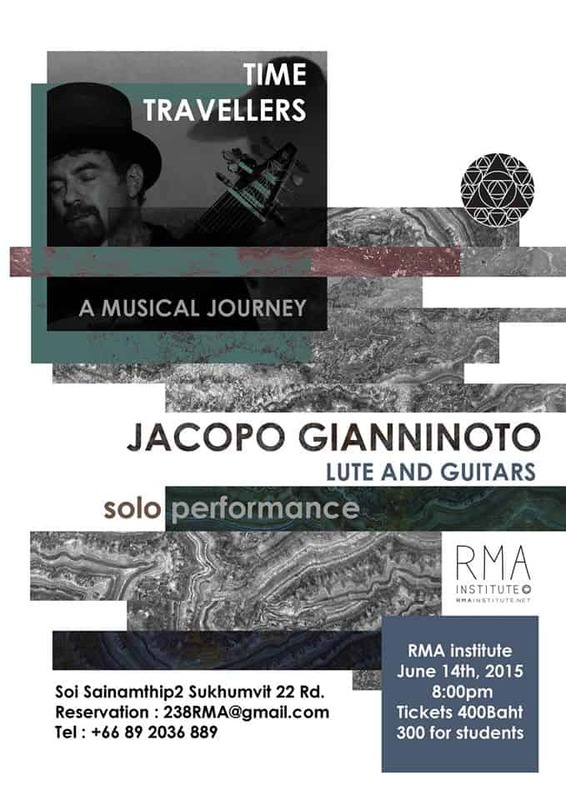 The performance will present several rare pieces from the Lute and Guitar repertoire, mainly from the Renaissance and Baroque periods, together with newly composed contemporary works and improvisations. The selection from the ancient repertoire will bring to the audience a set of pieces that even being written 400 or even 500 years ago appear to be somehow very “contemporary” and ahead of their time, imagining those composers could have been time travelers – or in a more philosophical approach they transcended time – and the contemporary repertoire is somehow composed with the ancient spirit and approach to music in mind.